In a medium saucepan melt the butter over medium-low heat until melted. Remove from the heat and stir in both sugars and mix until smooth. Chill the mixture for 10 minutes. Remove from the refrigerator and using a wooden spoon or hand mixer, stir in the egg, egg yolk, and vanilla. 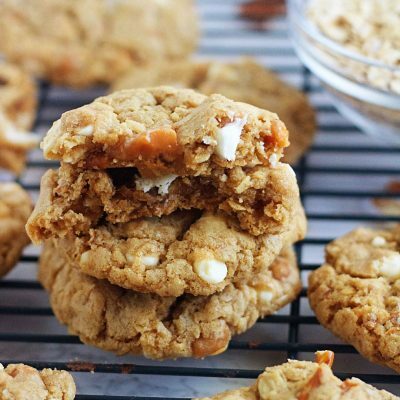 Stir in the white chocolate chips, pretzels and caramel bits. Roll by hand into 24 medium-size balls or use a scoop. Sprinkle with sea salt (if desired) and place on cookie sheets lined with parchment paper or a silpat liner. Put cookie sheets in the fridge and chill for 30 minutes. Preheat the oven to 325 degrees F. Remove the cookies from the refrigerator and bake for 11 to 14 minutes. I love to freeze these dough balls and take them straight from the freezer and bake them. When I bake them frozen, I end up cooking them about 14 to 15 minutes. When I bake these after just being chilled for 30 minutes, I bake them for 11 to 12 minutes because I like them to be more on the gooey/soft side. If you want them to be slightly crispy on the outside then bake them 14 minutes (like I did for the cookies pictures, but really meant to cook them only 12 minutes, didn’t hear the timer -- lol!). If you don’t have dark brown sugar, you can use light brown sugar and these will still be delicious. The dark brown sugar just gives these cookies a little bit richer, deeper flavor. I always keep a bag of dark brown sugar on hand just because I have a few cookies recipes that I use the dark brown sugar in.